Own Friends - 4 Coaster Set from Deff, DVD, Blu-Ray & 4K Video Specialists - Free UK Delivery..
Own Friends - Central Perk Framed Print 30 x 40 from Deff, DVD, Blu-Ray & 4K Video Specialists - Free UK Delivery..
Own Friends - Central Perk Framed Print 30 x 75 from Deff, DVD, Blu-Ray & 4K Video Specialists - Free UK Delivery..
Own Friends - Central Perk Logo Mug from Deff, DVD, Blu-Ray & 4K Video Specialists - Free UK Delivery..
Own Friends - Central Perk Travel Mug from Deff, DVD, Blu-Ray & 4K Video Specialists - Free UK Delivery..
Own Friends - Girder Framed Print 30 x 75 from Deff, DVD, Blu-Ray & 4K Video Specialists - Free UK Delivery..
Own Friends - Girder Mug from Deff, DVD, Blu-Ray & 4K Video Specialists - Free UK Delivery..
Own Friends - How You Doin Doormat from Deff, DVD, Blu-Ray & 4K Video Specialists - Free UK Delivery..
Own Friends - How You Doin Mug from Deff, DVD, Blu-Ray & 4K Video Specialists - Free UK Delivery..
Own Friends - Iconographic Travel Mug from Deff, DVD, Blu-Ray & 4K Video Specialists - Free UK Delivery..
Own Friends - Lunch on a Skyscraper Mug from Deff, DVD, Blu-Ray & 4K Video Specialists - Free UK Delivery..
Own Friends - Polaroids Mug from Deff, DVD, Blu-Ray & 4K Video Specialists - Free UK Delivery..
Own Friends - Regina Felange Mug from Deff, DVD, Blu-Ray & 4K Video Specialists - Free UK Delivery..
Own Friends - Smelly Cat Mug from Deff, DVD, Blu-Ray & 4K Video Specialists - Free UK Delivery..
Own Friends - Symbols Mug from Deff, DVD, Blu-Ray & 4K Video Specialists - Free UK Delivery..
Own Friends - We Were On A break Mug from Deff, DVD, Blu-Ray & 4K Video Specialists - Free UK Delivery..
Modern Manhattanites Rachel, Monica, Phoebe, Joey, Chandler and Ross are back in beautiful new box set, featuring all 236 original episodes completely remastered from 35 mm negatives to a luminous high-definition widescreen image with 5.1 audio. A keepsake episode guide and over 4 hours of new bonus extras create hilarious, heartwarming memories of your favorite Friends!Special Features Special Features May Not Be In High Definition. .. Experience Friends Like Never Before! 15th Anniversary Collector's Edition includes extended episodes, extra special features and an all new episode guide. All the laughs , all the loves, all the lattes - all yours! Rachel, Monica, Phoebe, Joey, Chandler and Ross were always there for each other. Now they're here for you in the complete 10-season set of friends.Special Features 5 Hours Of Extended Unseen Episodic Footage!, Additional .. 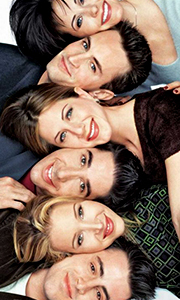 The groundbreaking first series chronicles the burgeoning friendships of Rachel, Monica, Phoebe, Joey, Chandler and Ross as they first charmed audiences worldwide. Through thick and thin, Friends became a global smash hit. Series Two features classic episodes such as The One Where Ross and Rachel... You Know, and The One Where Joey Moves Out. Series Three includes the infamous "We were on a break!" episode and for the first time, the ch..
Series Four of Friends contains such gems as The One Where Ross Says Rachel, and The One Where Chandler Is Shut In A Box. The unforgettable Series Five is bookended with weddings and travels from London to Las Vegas. Episodes include The One With Chandler's Fake Work Laugh and The One Where They All Find Out About Monica and Chandler. Changing room-mates, new romances and a unique look at what could have been have made Series Six one of..
You are cordially invited to join the festivities as the gang prepares for Monica and Chandler's wedding alongside the episodes where Joey dates Rachel and the first appearance of baby Emma. Series Nine includes the hilarious two-part finale where they all go to Barbados. Filled with humour and bittersweet emotion, the tenth and final series of Friends finds Rachel, Monica, Phoebe, Joey, Chandler and Ross embarking on the next chapters ..
From the beloved 10-year landmark series comes this comedy classic's best installments of holiday cheer, with all its traditional - and not so traditional - warmth and wonder!Episodes: The One with the Monkey The One where Rachel Quits The One with the Inappropriate Sister The One with the Holiday Armadillo..
Own Friends - Big Deal Mug from Deff, DVD, Blu-Ray & 4K Video Specialists - Free UK Delivery..
Own Friends - Central Perk Green Mug from Deff, DVD, Blu-Ray & 4K Video Specialists - Free UK Delivery..
Own Friends - Central Perk Mug from Deff, DVD, Blu-Ray & 4K Video Specialists - Free UK Delivery..
Own Friends - How you Doin' - Dots Mug from Deff, DVD, Blu-Ray & 4K Video Specialists - Free UK Delivery..
Own Friends - How You Doin' Mug from Deff, DVD, Blu-Ray & 4K Video Specialists - Free UK Delivery..
Own Friends - Logo White Mug from Deff, DVD, Blu-Ray & 4K Video Specialists - Free UK Delivery..
Own Friends - On a Break Blue Mug from Deff, DVD, Blu-Ray & 4K Video Specialists - Free UK Delivery..
Own Friends - Princess Consuela Mug from Deff, DVD, Blu-Ray & 4K Video Specialists - Free UK Delivery..
Own Friends - Regina Phalange Mug from Deff, DVD, Blu-Ray & 4K Video Specialists - Free UK Delivery..
Own Friends - We Know Yellow Mug from Deff, DVD, Blu-Ray & 4K Video Specialists - Free UK Delivery..
Own Friends - We Were On A Break! Mug from Deff, DVD, Blu-Ray & 4K Video Specialists - Free UK Delivery..
Own Friends - You're my Lobster Red Mug from Deff, DVD, Blu-Ray & 4K Video Specialists - Free UK Delivery..
Own Friends Don't Lie Mug from Deff, DVD, Blu-Ray & 4K Video Specialists - Free UK Delivery..
For all loyal patrons of Central Perk, this Deluxe 4-Disc Set Of The Complete Season One contains Special Features every fan of Friends will savour. Revisit that first year in which Rachel (Jennifer Aniston), Monica (Courtney Cox Arquette), Phoebe (Lisa Kudrow), Joey (Matt LeBlanc), Chandler (Matthew Perry) and Ross (David Schwimmer) first charmed audiences worldwide. You'll be in fabulous company.Special Features Friends Of Friends, ..